Do you buy the pattern and then find the fabric to fit when you’re sewing? Or do you work the other way around? I must say that after years of working with vintage kimono material, I have got used to always letting the fabric do the talking. This is why I tend to buy material even though I have no immediate plans for it, and it then ends up sitting around until it decides to speak up. Last July I bought some fabric at the Oakleigh market, and over the summer break I finally got it to tell me that it wanted to be a mini-dress. 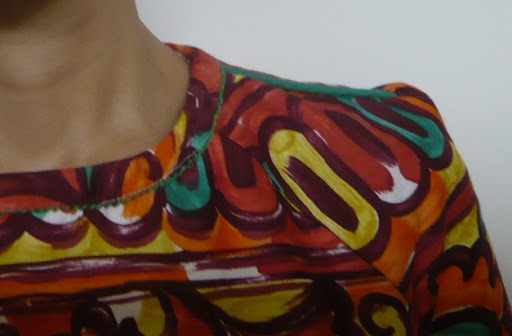 It’s a pretty simple pattern with raglan sleeves and with such a loud painted-looking pattern I’m fairly sure most people would have left it at that. But where would have been the fun in just whipping up a dress and not adding anything to it? So I decided to stitch around the neckline in green and also use some of my ample supply of bias binding to add a bit of interest (that probably no one but myself will notice). 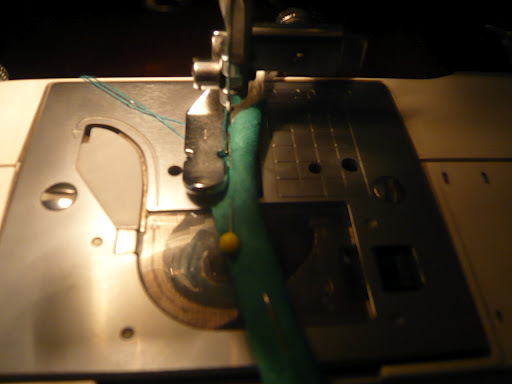 Simply wrap the binding around the cord and stitch it using the zipper foot on the machine, and (theoretically) hey presto, you’ve got piping at whatever width you like it instead of having to buy from the limited range on offer at the shops (and this way you can use up bits of material too, if you don’t have a shoebox full of bias binding like I do). Gorgeous! I'm totally with you on the fabric-comes-first approach. I am totally jealous of this fabric find of yours too. Totally onboard with the shop first-Ask it questions later approach to sewing! Love your dress! You look adorable!! I am with those who let the fabric speak-I buy fabric because it is beautiful. This looks amazing! I love how the fabric comes first for you, I think it makes total sense! I usually buy the fabric to suit the pattern, or an idea I might have. But usually end up using the fabric for something totally different and on the spur of the moment! Love this dress! That fabric is fantastic. I have never been to the Oakleigh Market – that is going to have to change now that I have seen the gems you can find there.I'm with you on finding the fabric first – I have piles of beautiful fabric waiting to be whipped up into something. And I'm quite boring – I generally use only a few sewing patterns. I like the fabric to be the feature. Actually, that dress is the style I love – raglan sleeves and a nice, boxy cut. Is it from a bought pattern or did you just whip it up yourself? Can't believe I missed this dress before, its great! I actually made a dress from fabric I bought from Bentleigh Market this morning too! Not yet blogged though..